On 13 April, Khaled Anany, Egyptian Minister of Antiquities announced the exceptional discovery of a 4,300-year-old Egyptian tomb in Saqqara, which belonging to a noble called ‘Khuwy’ and its walls have secrets. Professor Mohamed Megahed led the mission that discovered ‘Khoy tomb’ which according to an article in Egypt Today was made “while documenting the collection of pyramids that belong to King Djedkare Isesi.” This was the eighth and final ruler of the Fifth Dynasty of Egypt from late 25th-century to mid-24th century BC, an era known as the Old Kingdom. According to reporters at The Times of Israel , the design of the north wall and the entrance to the cemetery is an “architectural blueprint” of the royal pyramids of the Fifth Dynasty. The vast tomb, being called a “super structure”, has an L-shaped offering room and while the lower part is decorated with reliefs, the upper limestones were stolen for other building projects. Part of the tomb has a descending corridor leading to a vestibule and its southern wall leads to a highly decorated antechamber; the north and south walls of which depict Khuwy sat in front of his offering table with an “offering list” was depicted on the east wall, opposite the palace-façade on the west wall. Another burial chamber within Khuwy’s tomb contained a destroyed white limestone sarcophagus (coffin) and a set of miniature vessels constructed of calcite and darkstones. Professor Megahed uncovered Khuwy’s human remains “between the stones,” and he was also able to recover oils and resins used to embalm Khuwy in preparation for his journey into the afterlife. It was only last summer that archaeologists in Egypt unveiled the tomb of an Old Kingdom priestess which was also covered in remarkably bright and well-preserved wall paintings. Agence-France Presse reported that the tomb was uncovered to the west of the Great Pyramid for a “ Priestess of Hathor identified as Hetpet ” and the paintings depict the high-ranking priestess in various scenarios with her children and hunting and fishing. Tomb paintings in the chamber of Hetpet. Egyptian Ministry of Antiquities. Like the recently discovered Khoy tomb, all of the prior press releases have been accompanied by stunning photos of beautiful reliefs and murals. But why did Fifth Dynasty Egyptians indulge in such garish art works? According to Egyptologist Leslie Anne Warden, Associate Professor of Art History and Archaeology at Roanoke College, an expert on Old Kingdom Egypt, speaking to Forbes: “When we think about Egypt, we tend to think of a Pharaoh who controlled the whole country, but what becomes clear with tombs such as this is how complex the bureaucracy under Pharaoh was.” What she means by this is that the tombs highlight the multiple and interconnected roles held by individuals. How Did Ancient Egyptians Achieve Such Bold and Bright Colors? Therefore, we can conclude that every one of these tombs discovered in Ancient Egypt is much more than the sum of its contents, for if we consider the lost skill sets required in the production of paints, they are ancient time capsules carrying the prized secrets of the world’s first alchemists. 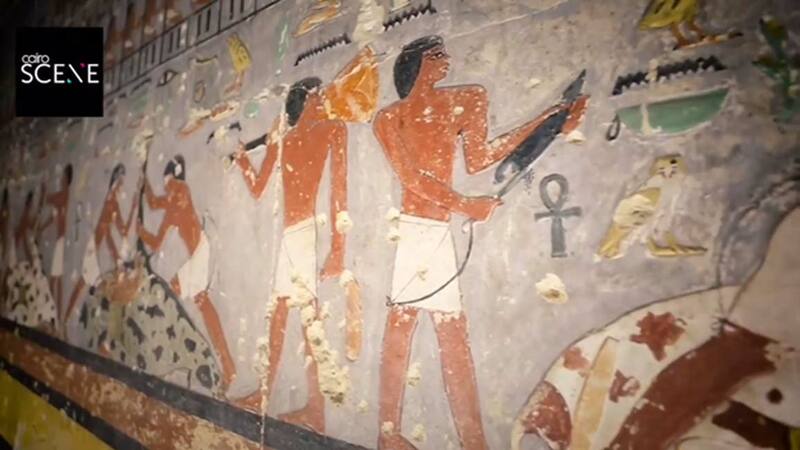 Top image: Brightly painted walls in the 4300-Year-Old Tomb discovered in Egypt. Credit: Screenshot from Ministry of Antiquities video. It's so wonderful to see these exquisite colors in situ and know that most other tombs also were painted with this much care and bright colors. Aren't we lucky to see these things as they were intended to be seen? Funny that a place, according to Plato "known for its blondes" never shows any blondes in its murals? Was Plato the deceiver, or is modern archaeology? Funny that a place, according to Plato "known for its blondes" never has any blondes in its murals? Was Plato the deceiver, or is modern archaeology?